Pleasant to see scores like this, ain't it? Coming off a last second effort on Saturday to snap a four game skid, our Penguins continued their winning ways with a solid overall effort from just about everyone. We were all a little hesitant as soon we heard the news about Goligoski and the dreaded 2-3 weeks we keep hearing about. Couple that with a 3rd jersey outing and no telling what the night would bring. And with the Ducks being a half-way decent squad with some big physical players our expectations were, well, somewhat on the fence. Truth is, when you have 6 guys on the shelf and four of them your top four defenseman, you have a tendency to question their efforts. The Penguins came out with a ton of energy and Crosby nearly netted his 11th of the season about 15 seconds into it. After a little back and forth Dad comes down and wrists one on net that scrummed around the corner ended up on the stick of Cooke from. First blood is drawn when Matt Cooke found the back of the net off what appeared to be a routine backhander, [1-0]. Shortly after the Pens go on their first powerplay of the night when Lupul boarded Jerk Store. Unfortunately the Pens continued their non-scoring ways and made it 0-29. The fact that the Ducks are 29th in the league on the PK makes you wonder how exactly the Pens didn't get one through. Nevertheless, they looked better anyway. Good news was after that penalty expired the Ducks got caught with too many men on the ice and the Pens go right back on. Feeding of the energy of the first power play, just 46 second into this one they end the drought. Standing in as the alternate captain with Gonchar out, Billy G finds a beauty in his wheel house from Crosby to beat Giguere like a rented mule, [2-0]. As with the first goal the Ducks seemingly handed this one over the Pens and essentially allowed it to happen. Again, 29th PK in the league. Two more minutes later Getzlaf heads to the sin bin for 2 of his 9 penalty minutes to put the Pens up a man again. And just when you thought everything could possibly go the Penguins way, they decide to show a little laziness of their own. On a line change after a dump into the Ducks zone, Todd Marchant gets a nice feed from the former London Knight Corey Perry and beats Fleury with a shorthanded backhander, [2-1]. And that was about it for the period scoring wise. Though despite being up 2-1 you could sense the momentum was in the Pens corner. A more balanced period here for both teams. The Ducks had 10 shots to the Penguins 6. Though just 2 minutes into the period Jerk Store heads to the box for high sticking Nick Boynton. To the benefit of the Pens the Ducks continued their lazy efforts of the night and turned the puck over in their own zone. Deryk Engelland's found a streaking Staal in the neutral zone who got ahead of the defense and beats Giguere blocker side, [3-1]. If you watch the replay Ryan Whitney must have thought for a second he was on the Penguins again the way he left Staal to himself. Whatever, we scored on their power play. Crosby nearly made it 4-1 on the doorstep of Jiggy only to get stoned like a 1st century Christian. Jerk Store misses a WIDE open net. Talbot scoring off the ice. The third was pretty much even in terms of shots as well. Though Fleury was having himself a night. How he didn't get a "star" of the game is beyond me. Kudos to Jordo and Cookie for their great efforts. The first story of this period was the goal from top-tier stand-in defenseman Martin Skoula. 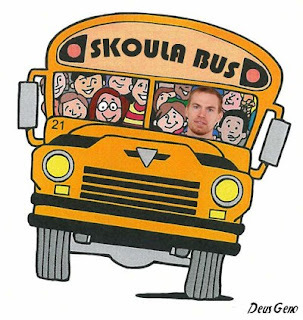 With a nice 4th line effort from Adams and company, Mike Rupp finds Skoula at the blue line. A little toss on goal and there you have it, [4-1]. 3:28 into the third period and you already knew the outcome. 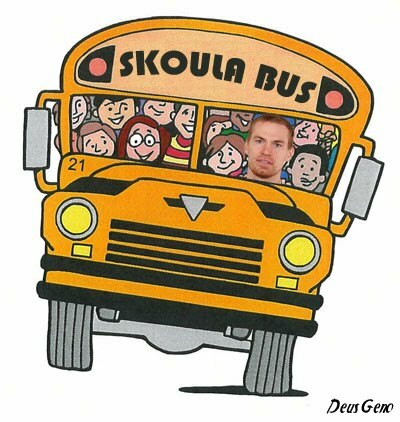 Can't stop the Skoula Bus. The Pens had some good chances throughout the period. Dare I say maybe even Jerk Store? On a little chipper through the neutral zone Crosby found JS who backhanded to Staal, back to JS, to Staal for a shot on goal. Staal knew to take the shot and not put it back in the hands of JS. The second story of the period, despite happening before the Skoula goal, was recent 39 year old Billy G dropping the gloves with Getzlaf. The fight wasn't much to talk about other than the 220 lbs shoulder press of Guerin dropping Getlaf to the ice. The Ducks did end up getting on the score sheet again when Teemu Selanne scored his 589th goal at the 17:21 mark, [4-2]. Too little too late. Though Randy Carlyle had no choice but to put one last effort forth and empty his net. Fleury attempted to get a goal but couldn't connect. It was Matt Cooke who found the back of the empty net for his second of the night from an unselfish dish from Staal, [5-2]. Goes to Joe Yerdon for rightly noting the impact of Jerk Store. Engelland, Geunin, and Lovejoy = NHL caliber. Two-headed Monster with 1 point. Though the score sheet doesn't do them justice. 2-3 Weeks? I HOPE not. Rutherford zapowiada zmiany; Kto pojedzie na MŚ?